A standalone garage is the perfect solution for protecting your vehicle and meeting other storage needs. But unfortunately, some people never pursue the option of adding a wooden garage to their property, either because they think it will be too expensive or because they lack construction know-how. If either of these factors are keeping you from seriously considering wooden garages to meet your storage needs, you have come to the right place for affordable wood garage buildings. 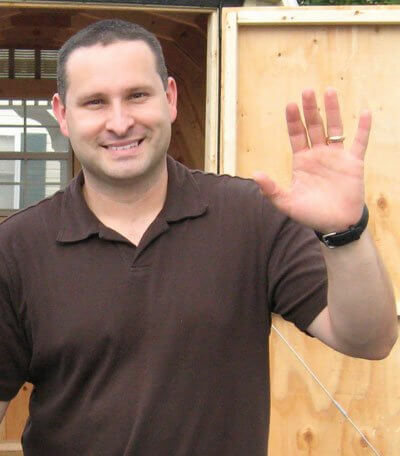 A low-cost, well-built prefabricated wood garage from Alan’s Factory Outlet allows you to get the benefits of a standalone garage affordably and conveniently. You can also get wood garage building kits if you’d prefer to put together your structure yourself. 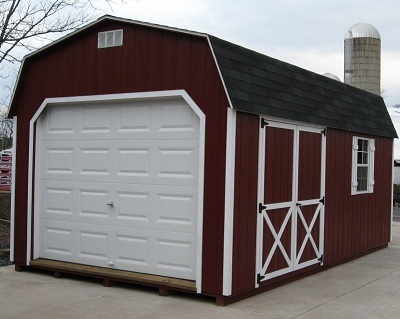 Alan’s Factory Outlet’s Amish prefab wood garages come in a variety of sizes to meet a variety of needs. We understand that not everyone has the same space and storage needs, so we have made sure to offer a wide range of different wooden garage options. People across the country trust these prefabricated wood garage structures because of their quality construction and storage capabilities, and countless happy customers have had one or more of these prefab wood garage buildings installed on their property in order to provide the additional storage for which they have been searching. We also offer prefab wood garage kits in a wide array of sizes, from 30x40 wood garage kits to 12x12 models. These wood garage kits are easy to assemble and give you a wooden garage that you will enjoy for years to come. Prefabricated garages and prefab wood garage kits come with either a barn or an A-frame roof, and you can also choose features such as trim colors and elements like windows and doors to create a custom garage uniquely suited to your needs. No matter which options you choose, the quality construction will extend to all parts of these wood garages, so you can be sure that any prefabricated wooden garage that you buy from us will hold up quite well over time. For example, our wood garages and wood garage kits are made with DuraTemp T1-11 wood siding, which has a 25-year warranty. You can feel confident that your prefab wood garage will last several decades when you order one of our wood garage buildings and have it shipped to your property. Wood garages can be upgraded to a 40-year metal roof or 30-year architectural shingles, felt paper, and pressure-treated 2x4 floor joists. Wooden buildings in our online selection come painted in your choice of colors. These wood garage buildings are delivered fully assembled in the size, color, and style you want unless you purchase one of our prefab wood garage kits. Portable garages are also available, and these come in 12-foot-wide and 14-foot-wide models in many different lengths to suit the needs of virtually anyone who is in need of a prefab wooden garage. These Amish-built garages can also be constructed as vinyl garages if you would prefer a material other than wood. We also make our wood garages available without a floor for those who want to build their wooden garage on a concrete slab or gravel pad. Garages are the same price with or without a floor. Our garages are portable, so they can be moved if you move to another piece of land or want your garage moved to a new location on your existing property. This is true of all of the buildings that come preassembled or that you put together from our 30x40 wood garage kits. Should you need more space from your wooden garage, Alan’s Factory Outlet also has wood prefab two-car garages and prefabricated two-story garages in our selection of wood building kits. Metal garages and carports are also available in our extensive inventory, so you are not limited only to wood garage buildings. 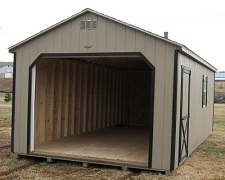 Call now for more information on our wood garage kits and metal building options and get the right storage structure for you!